​What Skills Do Public Sector Leaders ​Need Today? ​Welcome to Inside Public Sector Leadership! IPSL is a live, on-line mentoring program designed to explore the unwritten protocols and grey areas that leaders in today’s public service need to navigate in an environment of increasingly centralized decision making, a stronger political service, permanent campaigning, big data and a 24/7 news cycle. Special Savings for IPAC Members. ​This inter-active course brings attention to leadership skills and understanding through stories of experience told by expert mentors who have been there - those leaders who have previously held senior bureaucratic roles or elected office in provincial and federal governments in Canada. ​Our expert mentor panelists will answer audience questions and offer their perspectives on how to approach the challenges you face to succeed and advance in your career. Watch the live panels on-line and get access to the session recordings to review afterwards as many times as you like for a full year.
" This is the kind of highly practical and relevant real world advice that is missing from much management training. I appreciate how finely tuned the material is to the challenge of executive leadership in the public service. The examples are great. Thank you and keep it coming." 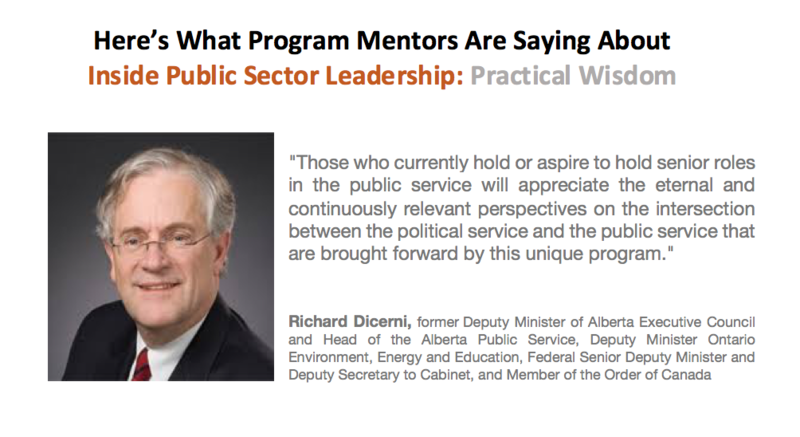 ​Past President, Institute of Public Administration of Canada.